DEALER CAR SEARCH has received a “Top Rated” CRM - Sales Department Award in the eighth annual DrivingSales Dealer Satisfaction Awards, presented at a special event in conjunction with the 2018 National Automobile Dealers Association (NADA) Convention & Expo. 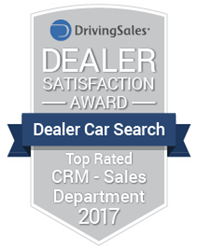 DEALER CAR SEARCH received a top rated dealer satisfaction ranking in the CRM - Sales Department category, as determined by the thousands of auto dealers who are part of the DrivingSales.com community. “We are very excited to receive this prestigious “Top Rated” CRM - Sales Department award. This award is about Dealer Satisfaction and so is Dealer Car Search. Customer Service and Satisfaction are at the very core of our company values, and I proudly accept this award on behalf of all of the outstanding, hardworking, men and women at Dealer Car Search,” said Rick Wilson, CEO of Dealer Car Search. DEALER CAR SEARCH has been a trusted and proven leader in the digital automotive landscape for over a decade building Responsive Websites, as well as, other products like; Website Texting, CRM, Call Tracking, Integrated Lead Management, Internet Advertising Management, Data Management, Reputation Management, Craigslist Postings, Pricing Tools, Inventory Turn Consulting and much more.